We are happy to print customer provided logos and monograms on our personalized items with no additional fees! Click here for art requirements. Personalized monogram napkins will add an elegant customized touch to your wedding, bridal shower, or anniversary party. 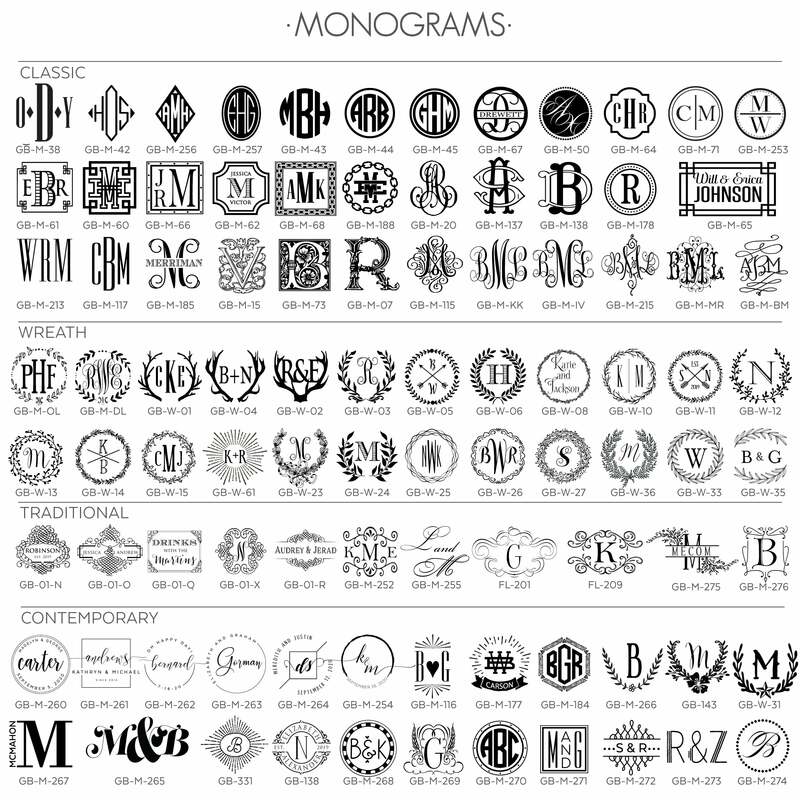 Your monogram is printed boldly in a script font and adorned with names and date, just below. Available in a vast array of colors and styles to match any event theme! Thank you so much for choosing Gracious Bridal Design House! We are honored that you appreciate our style, and want you to be wowed by our service and our product. When you receive your item, please leave us a review below! If anything is less than stellar, please contact us. Our goal is for you to have a fabulous experience. We can imprint custom logos and artwork! There is no fee if the artwork is submitted in the following format. It can then be used on many of our other items with no additional fee. If you do not have access to your art in vector format, we may be able to convert your art for a fee. Alternatively, we can create something custom for you using any of our fonts, designs, or monograms for no additional fee. Please note that our prices include printing in one color, unless the listings is for a full color item. There are additional fees to print in two colors and subject to design approval. We specialize in custom orders, and will be happy to create that perfect, custom napkin just for you. Lets change it up! Colors, fonts, designs, states — we’ve got you covered! Please note that our colors are represented as accurately as possible. All computer screens / monitors / devices are calibrated differently, therefore seller is not responsible if the color on your screen does not match the actual color. 1. A digital black and white proof will be emailed within 2 business days for approval. 2. Once approval is received, the order will be sent into production. 3. Once the order has shipped, we will email a tracking number. 3 PLY - Soft, with the traditional coin-edged border. LINUN LINEN-LIKE - Luxurious, thick paper napkin, borderless. DIAMOND QUILTED - Subtly embossed diamond quilted pattern, borderless. LUXE MOIRE - Elegant moire pattern, with Caspari’s traditional diamond-edged border. BELLA - Dinner size only. Soft and elegant with the look and feel of linen, borderless. PATTERNED - Variety of fun and elegant patterns. Made in USA and Germany. Basic rule-of-thumb is 4 napkins per guest. This will vary depending upon the type of reception you are having. For a more detailed calculation, see the breakdown below. We recommend ordering extra napkins, especially if they will be used in multiple locations throughout the evening. If ordering a large quantity, consider not printing the date so that the remaining napkins may be used at home. APPETIZERS - If stations, 1 per person per station. If being passed, 1 per appetizer per person. BAR - 1.5 per person per bar is the absolute minimum (if you have two bar stations, you would allow 3 per person). CAKE - 1 per person. LATE NIGHT - For late-night or to-go snacks, 1 per person. RESTROOMS - Don’t forget the personalized guest towels in the restroom facilities, 1 per person.